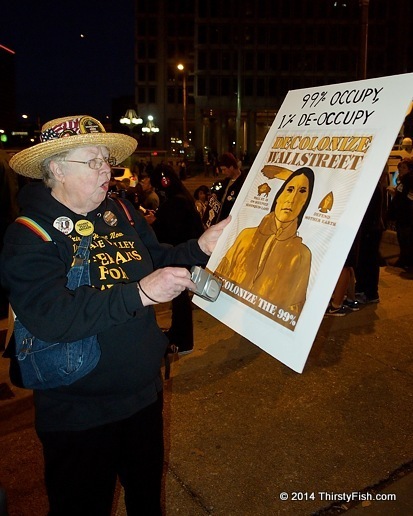 "Decolonize Wall Street"? Not likely! Money corrupts politics. 19th century American politics was defined by money. Late 19th century, the Gilded Age, was an era of rapid economic growth, but also an era of serious social problems. Tycoons monopolized their respective industries and de-facto bought up the political process. And people paid for it. The influence of big money in politics slowed down in 1907 with the The Tillman Act which prohibited monetary contribution to national political campaigns by corporations. The Taft-Hartley Act of 1947 did the same for Labor Unions. During the 20th century, Americans for the most part, prospered socially and economically. 20th century became the American Century. In their 2010 Citizens United decision, The Supreme Court held that the First Amendment right of Free Speech applied equally to corporations since corporations were people, therefore they could not be barred from political contributions. And just yesterday, The Supreme Court struck down political donation caps in the case known as McCutcheon v. FEC. Justice Stephen Breyer, in his dissent, summarized the implications of this ruling: "Taken together with [Citizens United], today's decision eviscerates our nation's campaign finance laws, leaving a remnant incapable of dealing with the grave problems of democratic legitimacy that those laws were intended to resolve". Only one more step remains, and that is the removal of all campaign contribution limits, currently set at $2,600 per election per candidate, and $5,000 per year per candidate. These rules can readily be circumvented through Super PAC's. All this means is, money rules politics. And who has the most money? Wall Street of course. Last week, to their shame (or rather shamelessness), potential 2016 GOP presidential hopefuls, governors Scott Walker, Chris Christie and John Kasich trekked off to Las Vegas in order to impress the casino mogul Sheldon Adelson. During the last presidential election, Adelson is said to have donated $100 million. Governor Chris Christie even apologized for a remark he made in his speech that was not acceptable to Adelson. Talk about puppets and puppet masters!